Put the 8 eggs in to the simmering basket and insert in to mixer bowl. Add 500 g or 17.6 oz warm water. Cook 14 min/steaming temperature/speed 1/MC on. When eggs have finished cooking, remove to a large bowl with 1 tray of ice cubes and cover with water. Let them sit for 10 minutes to cool down completely. Peel the eggs in the iced water and halve each one. Scoop out the yolks, retaining two whole yolks. Insert butterfly, add the two whole cooked yolks and two whole cooked egg whites, curry powder, salt and garlic powder to mixer bowl. Blend for 20 sec/speed 3/MC on. Scrape bowl down, add 1/2 tsp water and blend for a further 10 sec/speed 3/MC on. 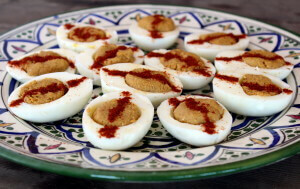 Scoop curried egg mixture into each egg white half and serve with a pinch of paprika. This serves 2 on HCG protocol. 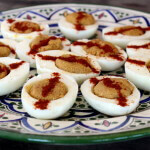 Give left over yolks to your family members or pets, they are very nutritional! At step 1 use ST temp and speed 3 if using an Intelli. Use 130°C or 270°Fs and speed 4 if using a Supercook. Credit to Ambs Milbourne‎ for the idea. Delicious!! Needed a break from meat in HCG Phase 2 and this really hit the spot. Thanks Nikalene! Great if you’re wanting a nice change from meat for a P2 protein serve, especially if on the go- shame they get eaten so quickly!